Canadian journalist Roderick Benns, publisher of the progressive news site Leaders and Legacies, has devoted much of the past two years to interviewing experts on basic income–with a focus on the possibility of a basic income in Canada. 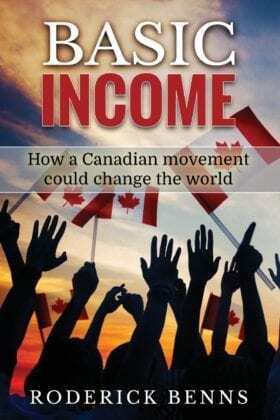 On the basis of the material accumulated in this time, Benns has now produced a 290-page book on basic income, Basic Income: How a Canadian Movement Could Change the World, which is now available for purchase through Amazon. Featuring scores of interviews and articles with prominent Canadians, including federal Green Party leader Elizabeth May, Senator Art Eggleton, and retired Senators Hugh Segal and Michael Meighen, there are also interviews with MPs Scott Brison and Dan Blaikie, as well as big city mayors like Calgary’s Naheed Nenshi and Edmonton’s Don Iveson. Benns also interviewed researchers, academics, educators, and medical doctors, along with average Canadians — to get them to imagine what their lives would be like under a basic income guarantee. In addition to writing for Leaders and Legacies, Benns assists with the communication efforts of BIEN’s Canadian affiliate, the Basic Income Canada Network. “New book on Basic Income by Leaders and Legacies publisher released” Leaders and Legacies (October 24, 2016). Roderick Benns (2016) Basic Income: How a Canadian Movement Could Change the World, CreateSpace Independent Publishing. Alleviating poverty is virtuous and gives those individuals opportunity to rise to their full potential so long as the proposition does not become a vice that squashes these individuals and their benefactors between oppressive taxes and a tyrannical authority. One does not write a blank check to creditors, sign a contract that does not have fully disclosed details nor confuse a robot that may take your job with technological disruption, venture capital animal spirits or an H1B1 visa worker[2,3]. A high budget item, like a permanently fixed basic income may devolve into a permanent taxpayer-funded wage subsidy as the market absorbs it into wage levels across the board. In addition, the higher taxes needed to sustain it may become a drag on the economy slowing business creation, job creation and socio-economic mobility in the private sector. This outcome may prompt a movement for a forced-labor government job guarantee program where government fixes the price of wages and workers are farmed out to private sector contractors. A NIT stipend combined with a child stipend may be less expensive, but the additional taxes required depress wages of all working families and especially single workers in the low-income bracket who may have otherwise fared better without the income drawback and added tax burden. For the USA, an individualized poverty-level tapering income for resident adult citizens* with medical goods & services and residential education facilities for orphans and children of single parents may have merit. It may replace the $1.2 trillion Federal and State Welfare spending. The marginal tax rate burden on income drawback may be mitigated with a flat tax on all economic transaction. This APT tax would also stimulate jobs for the economy by reducing taxes on productive businesses, increasing real wages for employees and reducing taxes on consumers along with the increasing counter-cyclical liquidity provided to Main Street by the tapering income during recession when creative destruction is taking place. Basic Income is not an Economic Issue luntil it is described with the words Basic Income]. I did not get the pleasure to read your book and I would be remissed having not replied to such a worthy cause. Please accept my humble words as I reach out to economists, principal shareholders and the real money makers with a better marketing scheme, one that will ensure that the human race survive, and seek harmony with nature. Experts in Capitalism teach innovators to build a better mousetrap, produce a good poison. Communication teaches us that all we have to do is ask them to leave. In 2 weeks I met three people with similar stories. My bait and trap were not as smart as the mice, I have lived with mice on and off my entire life, it happens, we all do, so a “squirty-two magnum” laden with heavy bleach, the intruders, wherever they were were shot, soaked if I backed them under the fridge. The front door to the outside world, where your boots are, has to swing open while you tell the intruders, No, out that Front Door, you are not welcome here, there is plenty out there! Others do not need a waterstream, they use food, leading the mice, night by night, closer to a makeshift backyard shelter, or basement window with a screen unhinged at a corner to let them out, red carpet and all. The point is an expert is not an expert at all if they do not adhere the natural, cyclycal laws of nature, which we are just finding out. Would it be a surprise to realize that Ancient Atlantis Smoked And Vaporised plant material to inhale in their lungs, instead of eating plant material? No, it would not, eh. We know how good it feels to see our neighbor succeed. How did we ever put that philanthropy into the trust of the Elite? The Medici? The you-know-who’s? It is we, who spruce up the neighborhoods. My time is short I will be back. Please, if 1 does not feel good BC they help their neighborhood get better results regularly, they find other ways to feel good. The humans r 2 smart to fail so be careful. Stick Around, keep talking, we will.